1. 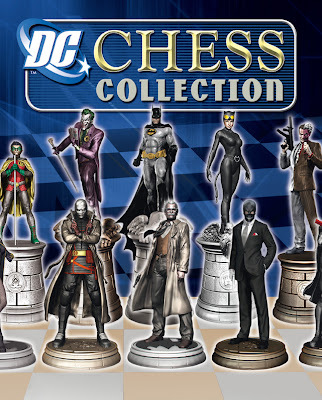 "Like" DC Chess Collection on Facebook. 2. Look at the column to the left that starts with "Wall". Keep going down until you see "Iconic Covers Competition". Click on that. 3. Here is where you will find the info you'll need. I'm having some trouble with some of the information not having room in the cell it's written in and not having a way to scroll down. I don't know if that is specific to my computer or a formatting issue with them. Make sure you find and read the terms and conditions. This is the nitty gritty of the rules and what to do. 4. Submit, peers vote through Facebook, a judging panel (featuring myself and some folks from DC) gets involved, and hopefully you will win. 5. The winner gets a custom figurine created by their sculptor. It can be you as a DC superhero, or it can be your own freaky superhero that you created on your own! 6. Here is the part that you may love the best. You can use a cover that you have already done for Covered. You can only submit one design though. Make it count! BAD NEWS - The contest can only be entered by people living in the U.S., U.K. and Ireland. I'm not sure why this is, maybe because these are the only places where DC Chess magazine is available. Excellent, I'm definitely going to enter! Calling Matt Allison. How else will we ever see a pewter representation of the Grief-Deliverer?